ClearGuard Backwash Air Kit Clearguard Large Air Kit Fits 8,000 and 1 | Fountain City Art Ctr. 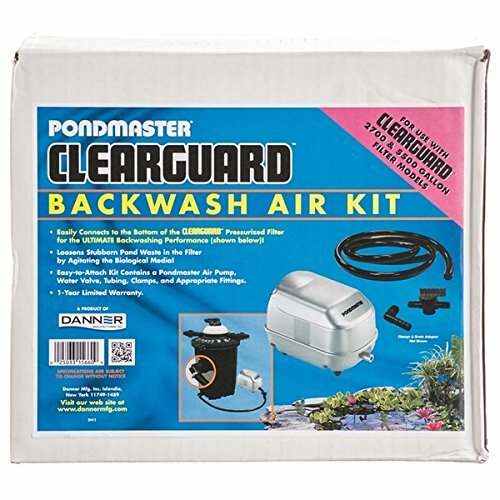 Ensure your existing Pondmaster Clearguard Pressurized Filter remains clear of debris and working properly with the Pondmaster Large Backwash Air Kit. This convenient kit provides all you need to clear waste and build up from your existing Pondmaster Clearguard Pressurized Filter with UV for 8000 gallons or Pondmaster Clearguard Pressurized Filter with UV for 16,000 gallons (not included), helping it run efficiently and provide the maximum of biological filtration. Adding air into the pressurized canister creates turbulence in it, aiding in clearing the unit of sludge and other debris prior to backwashing. The included fittings and 10' of vinyl tubing make attaching the included Pondmaster Air Pump simple, and the ball valve allows you to let just the right amount of air enter the tank. The pump uses only 59 Watts to run, and its plastic casing keeps it durable. Keep your existing Clearguard Pressurized Filter running smoothly with this Large Backwash Air Kit. One year limited warranty.